The Sketch Files: "To Infinity and Awaaaay!" or maybe " Up, Up and Beyond!" "To Infinity and Awaaaay!" or maybe " Up, Up and Beyond!" Honestly I just couldn't think of a good title. So here we have two Redd Rocket posts in a row. I decided to go with a more simplified style on this one. I think it works but just doesn't really get that sexyness across. Hopefully it has a sort of Saturday morning feel to it. It's not quite the same as my previous animation inspired R.R. post but it has some elements that I think work better. I'd like to find a happy medium between the two. I kinda prefer the "attitude" of the previous one. Hey Big J, nice blog you got going! 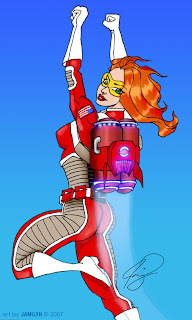 If it's cool with you, I'd like to do a pin up of the Rocket girl!? Thanks for the comments Alan. You can draw any of my characters anytime you want. I'd be honored and I'd love to post them on my blog too.